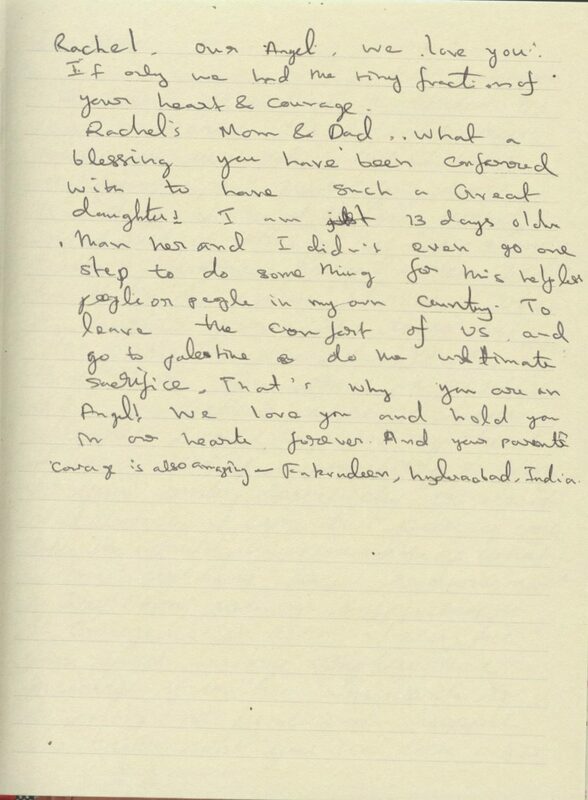 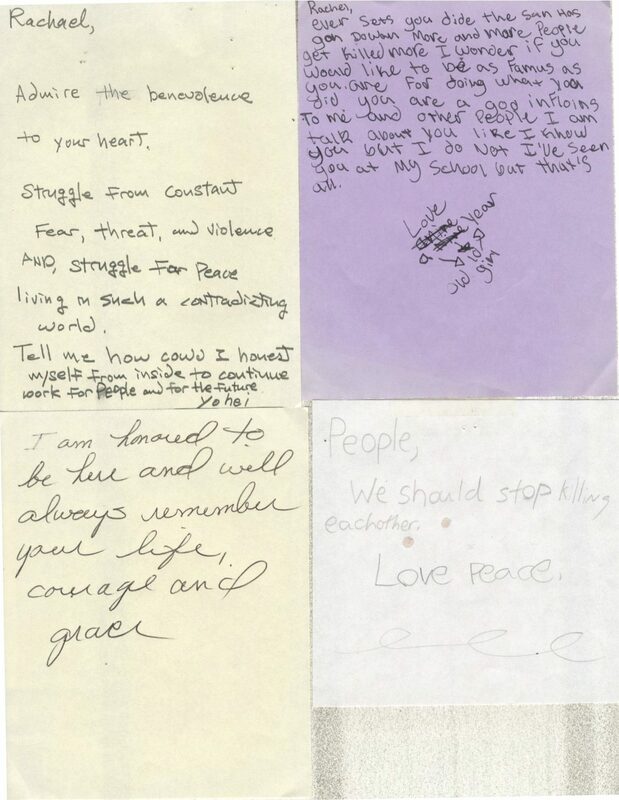 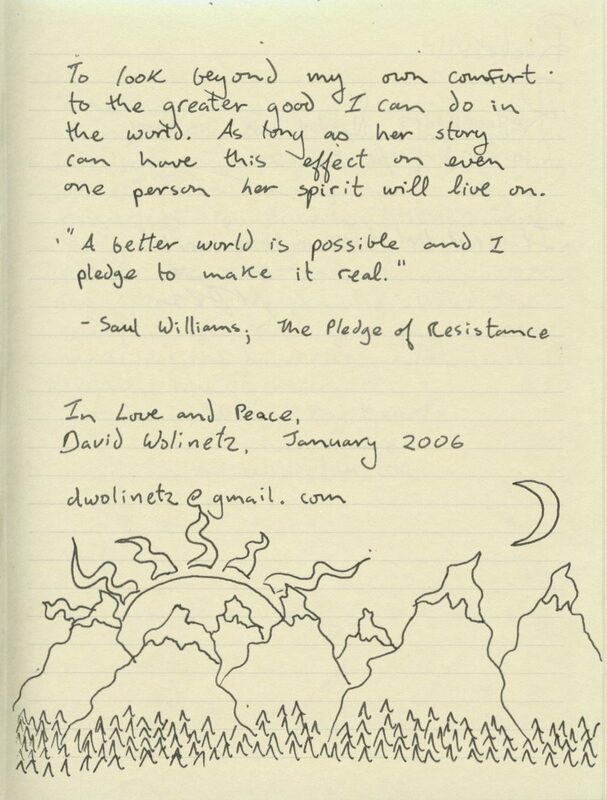 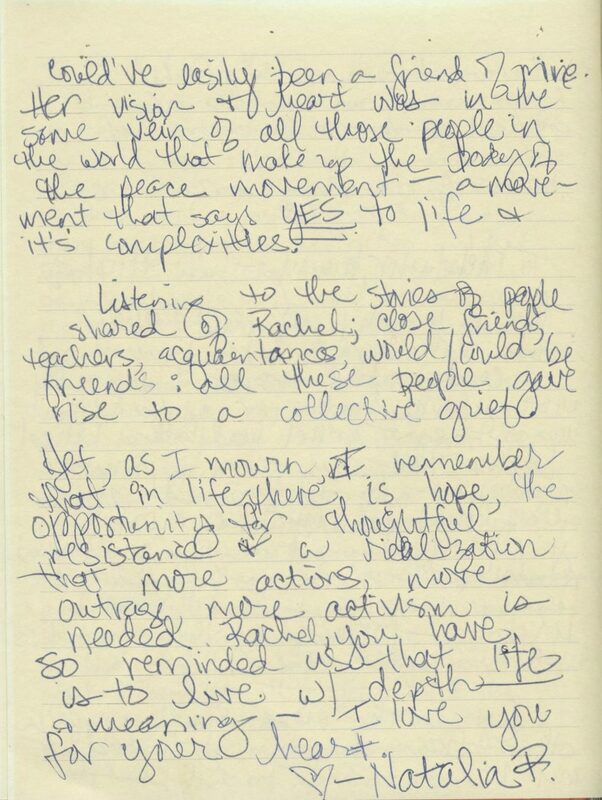 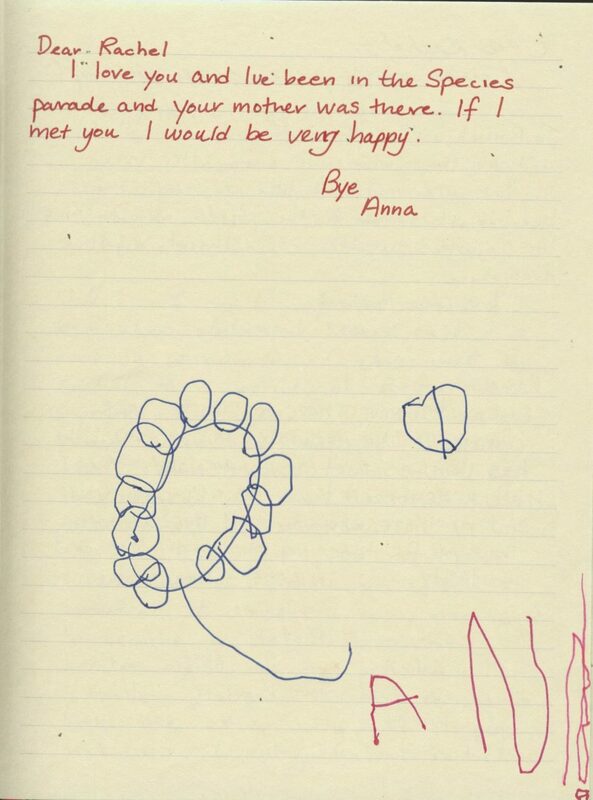 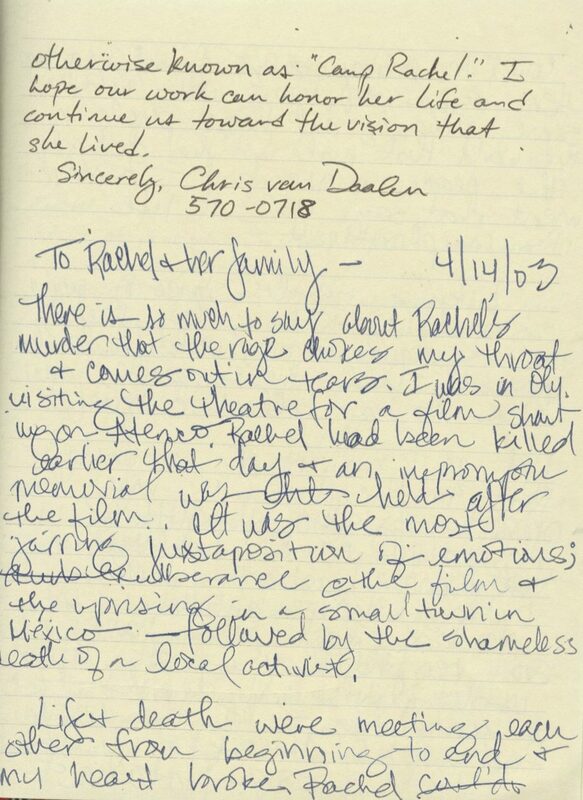 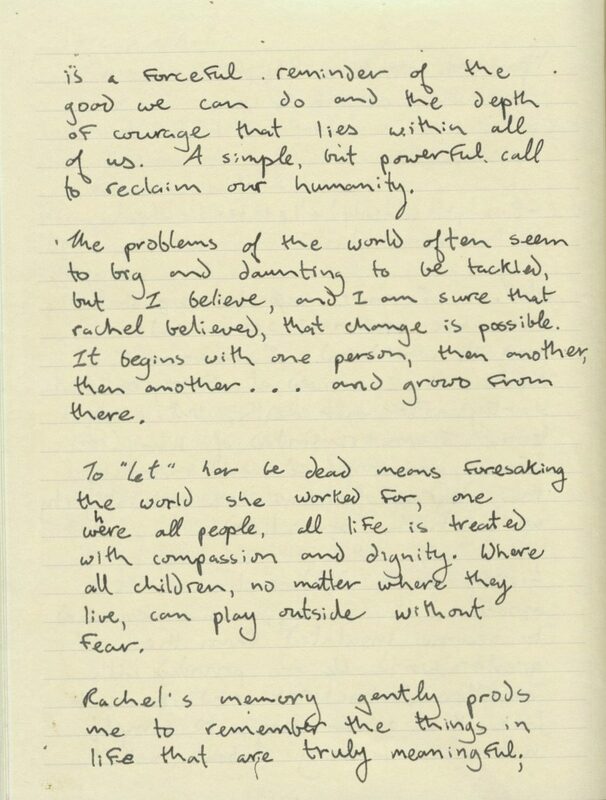 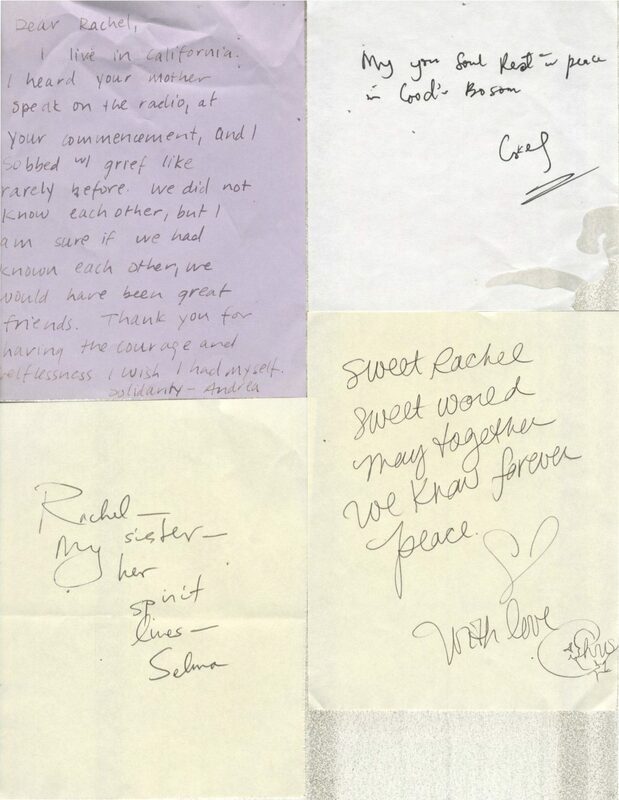 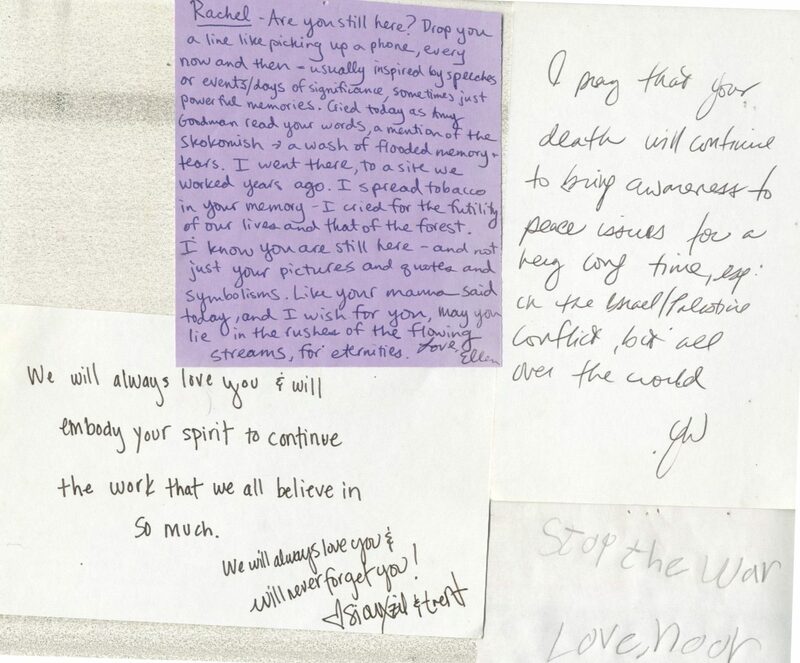 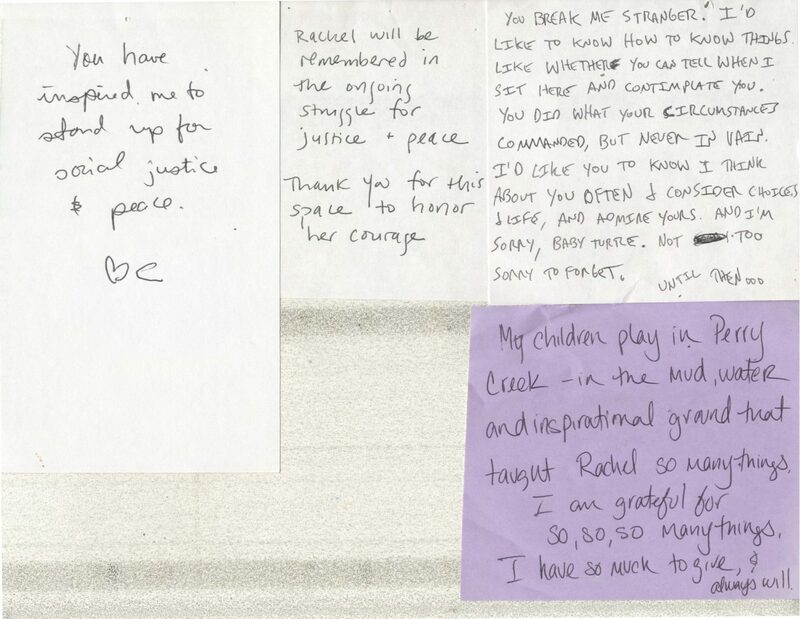 Letter from the Corrie Family, April 23, 2003, sent to the “Rapprochement” email list from the International Solidarity Movement (ISM). 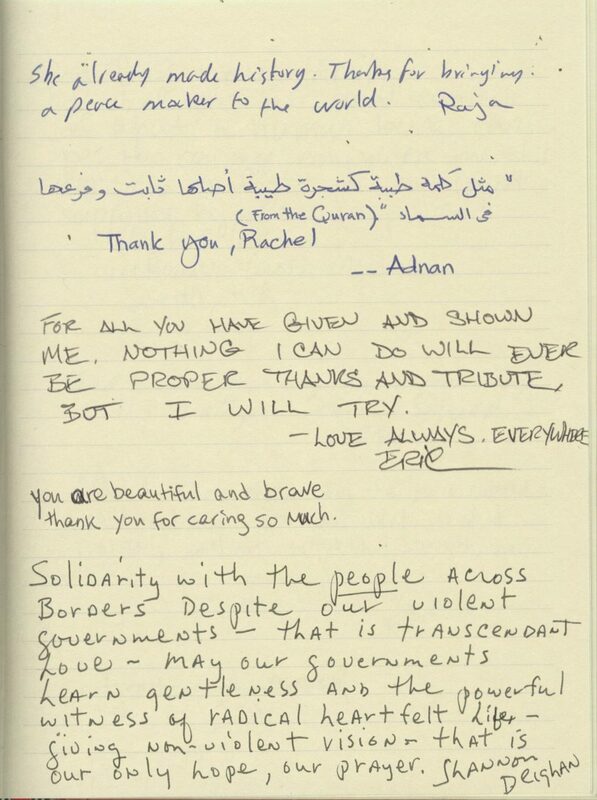 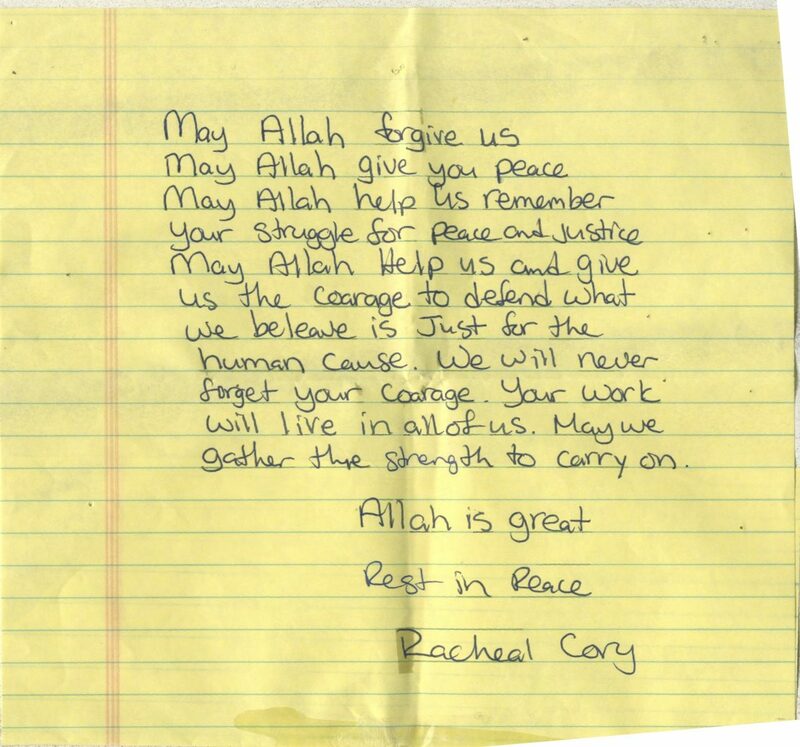 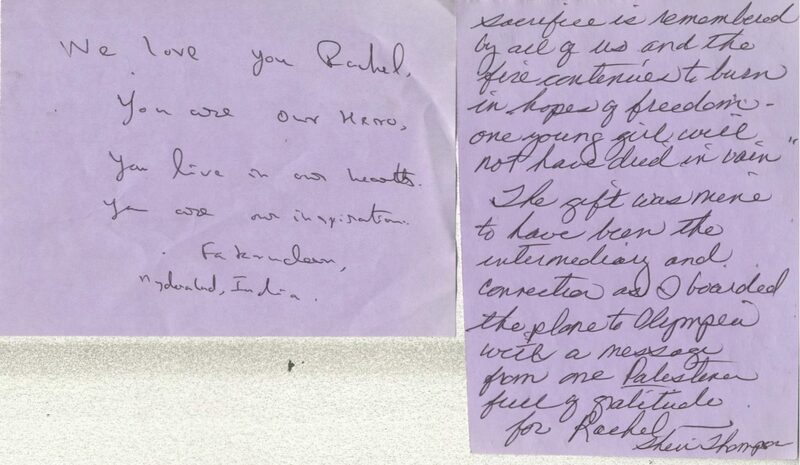 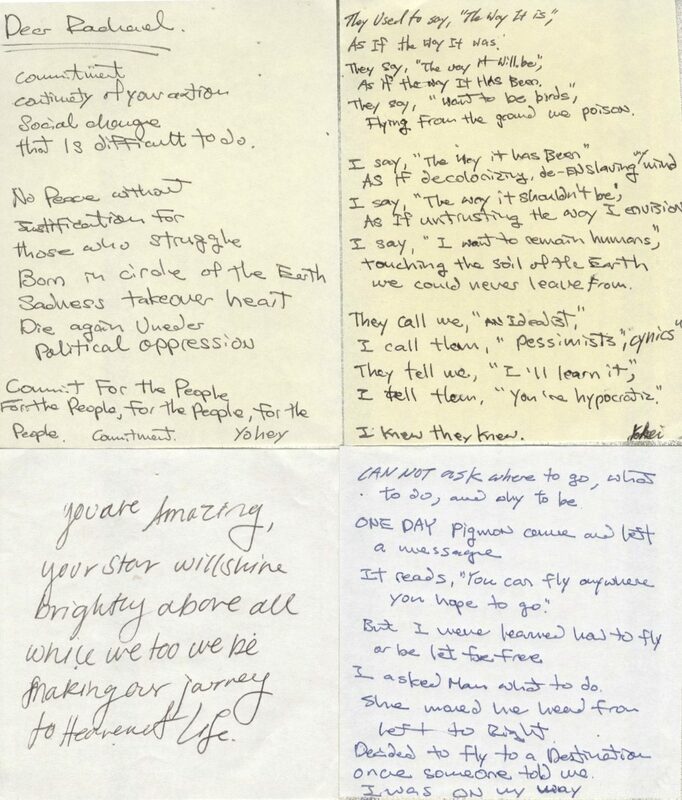 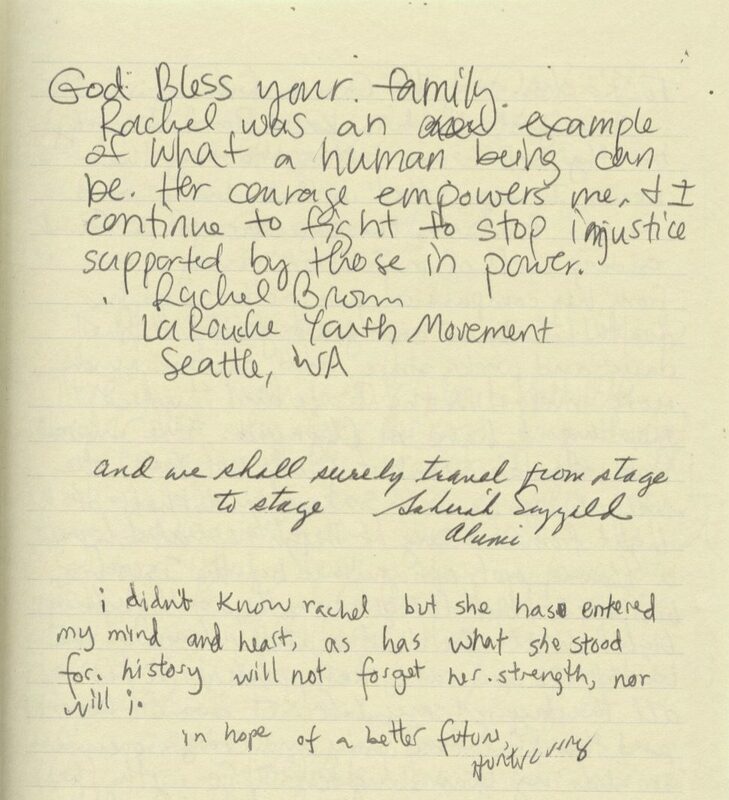 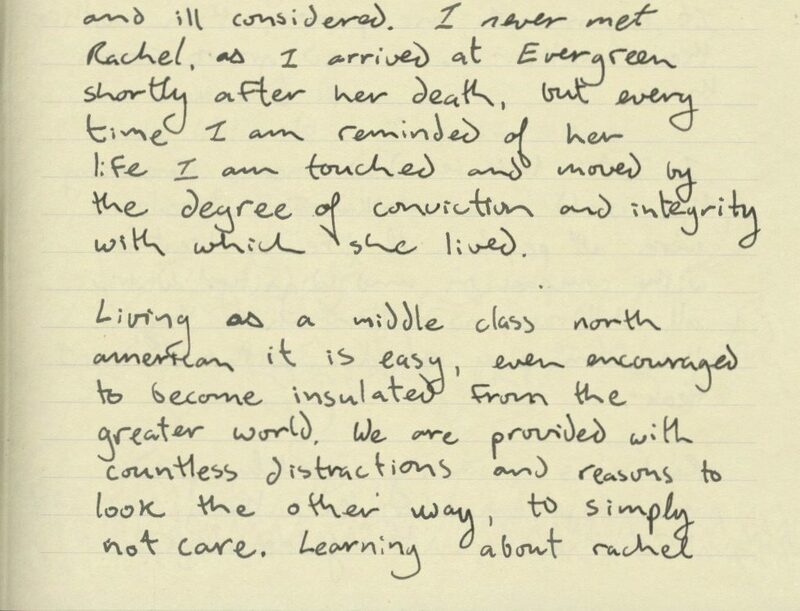 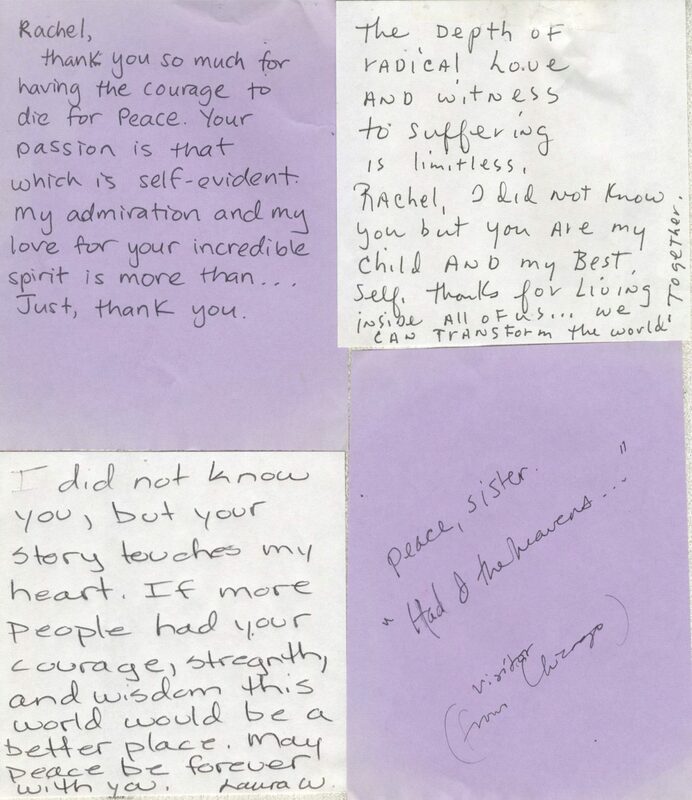 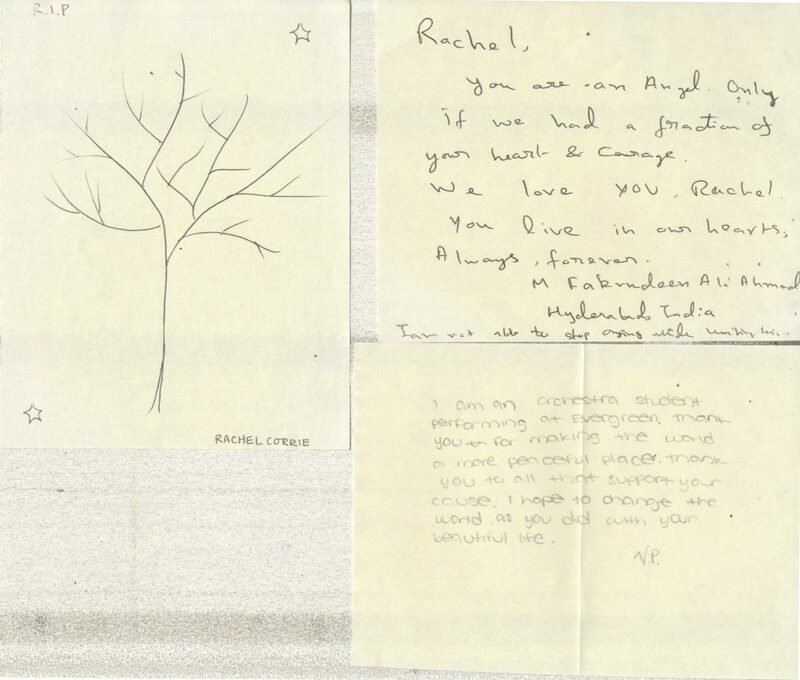 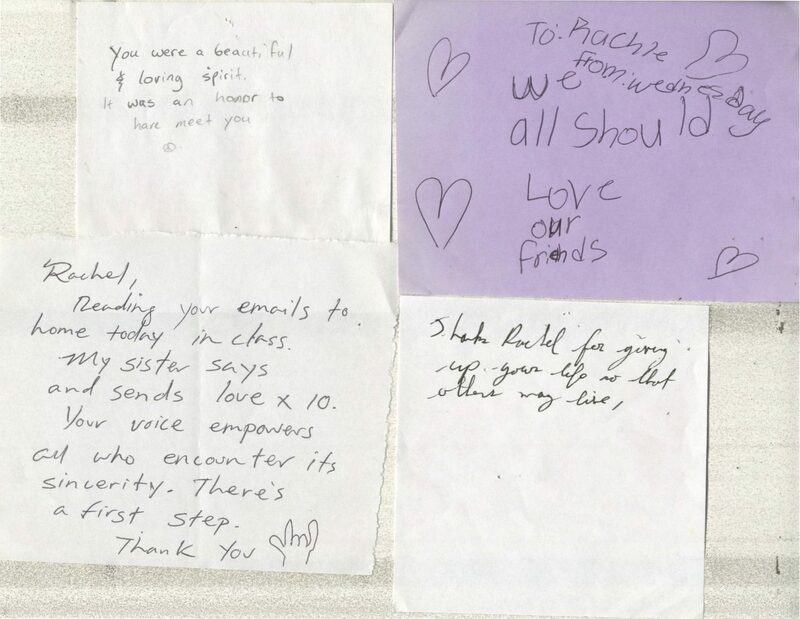 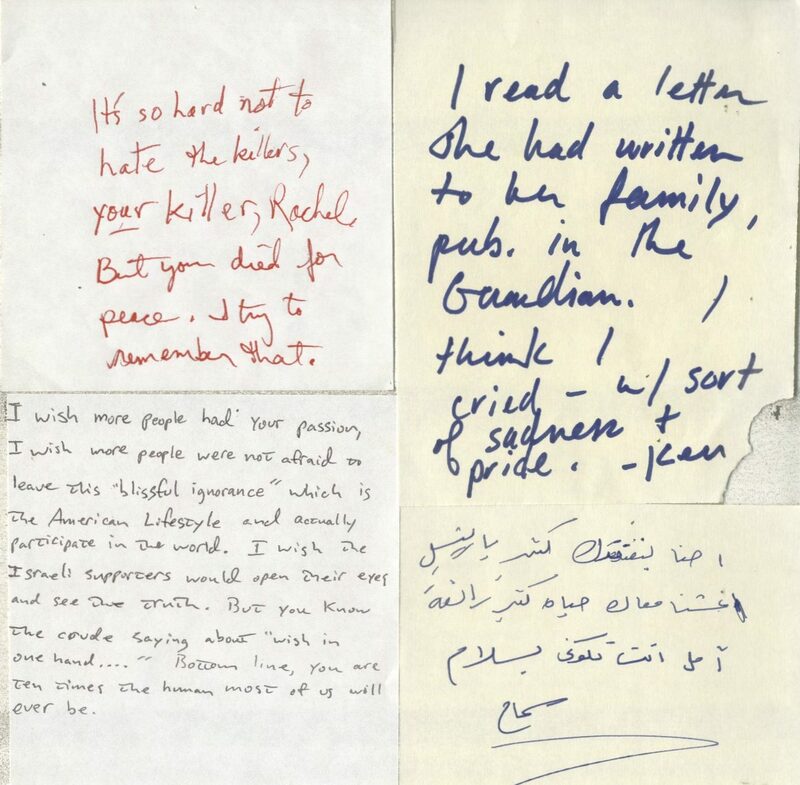 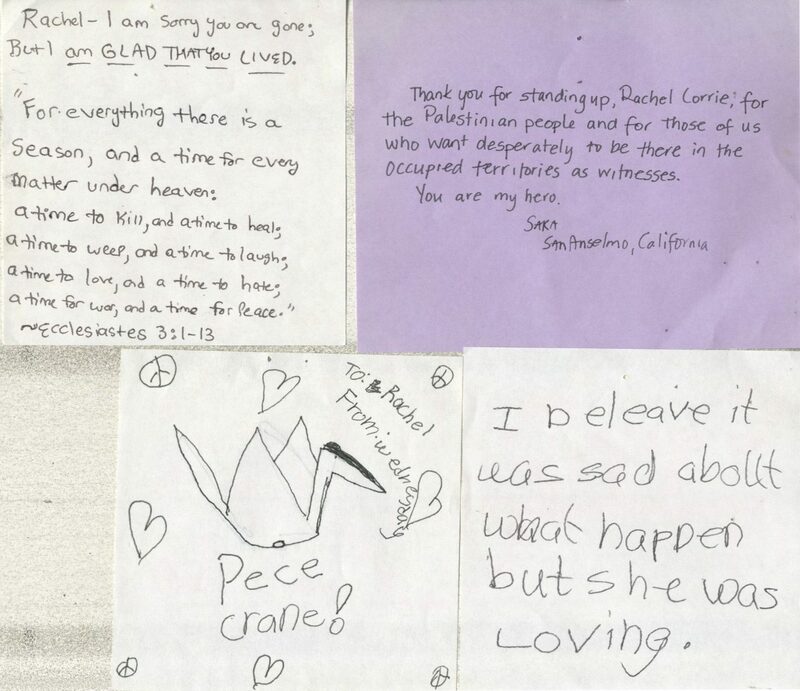 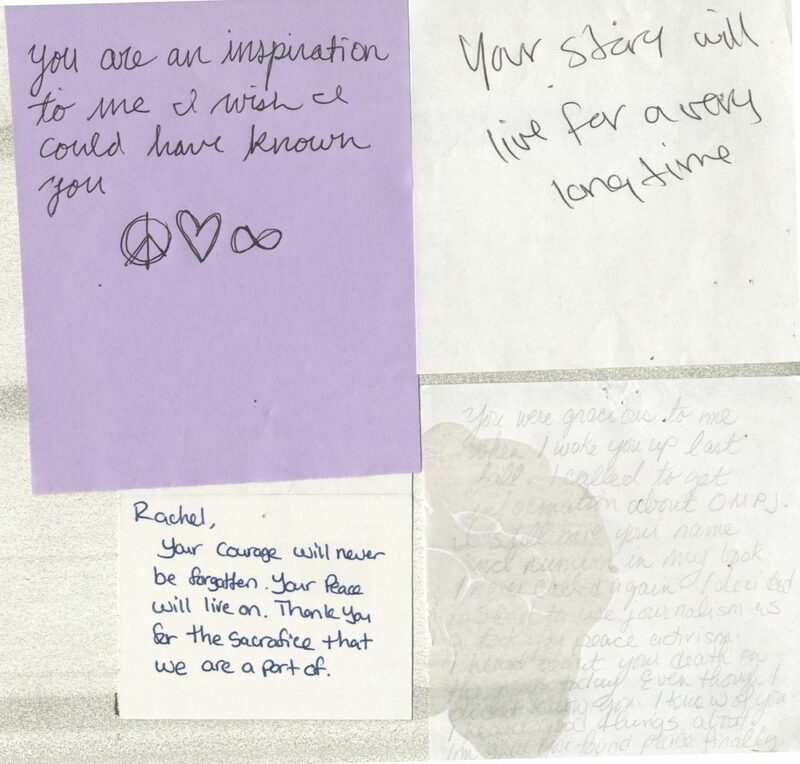 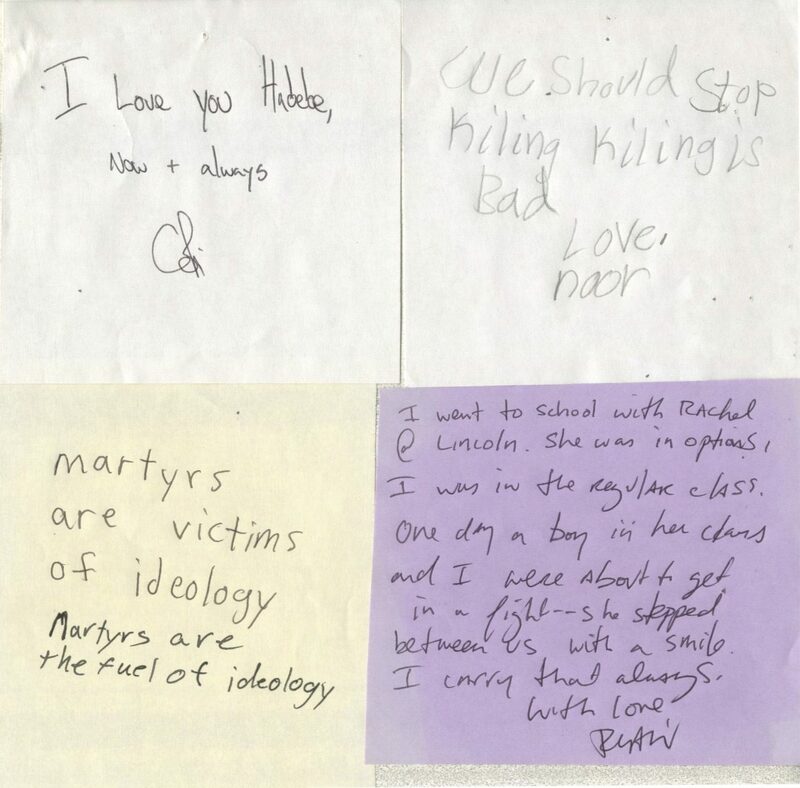 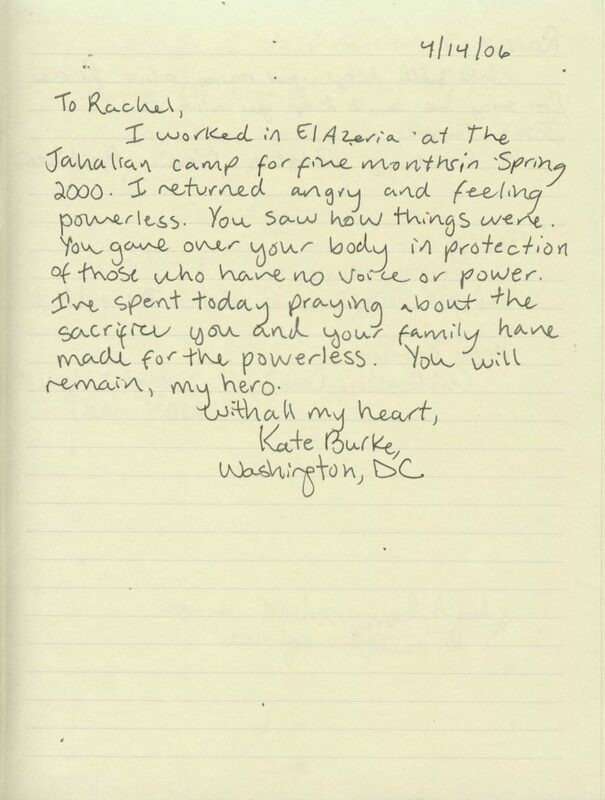 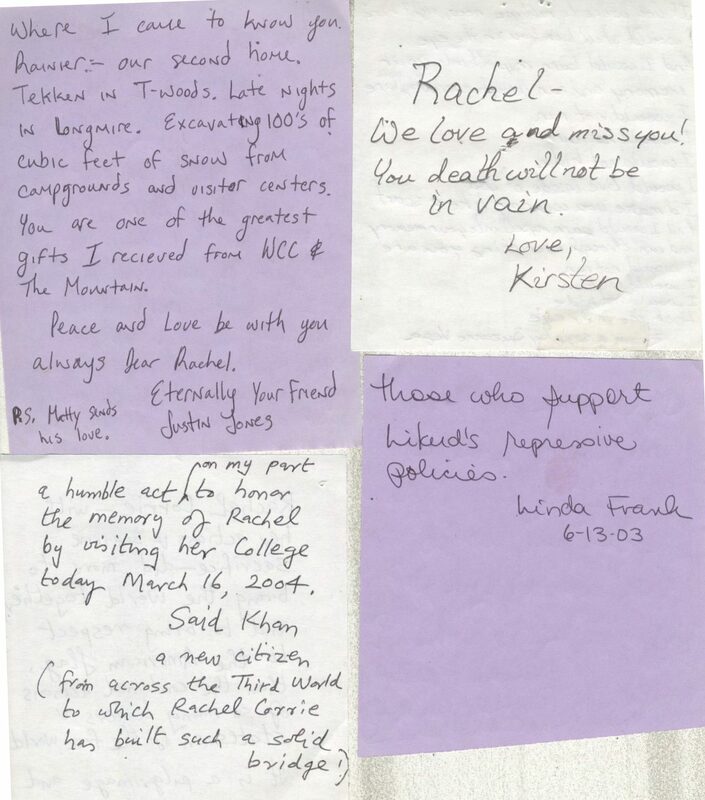 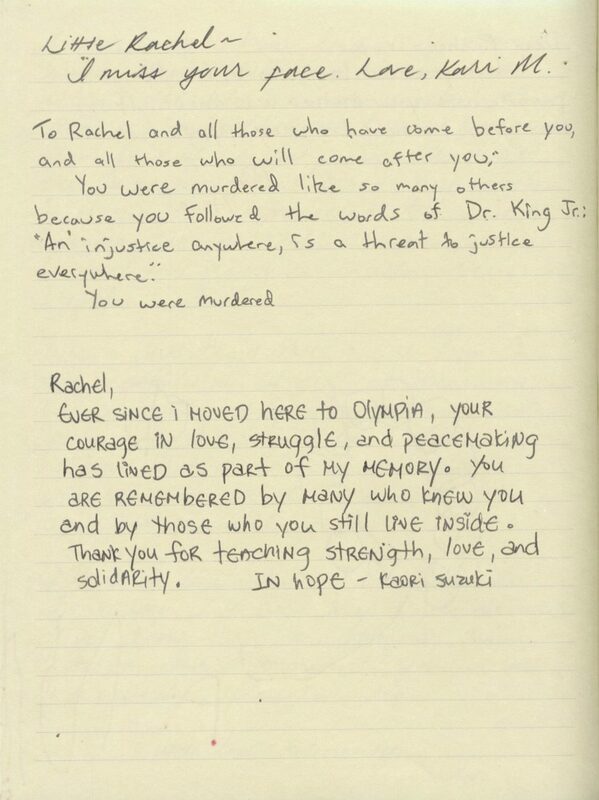 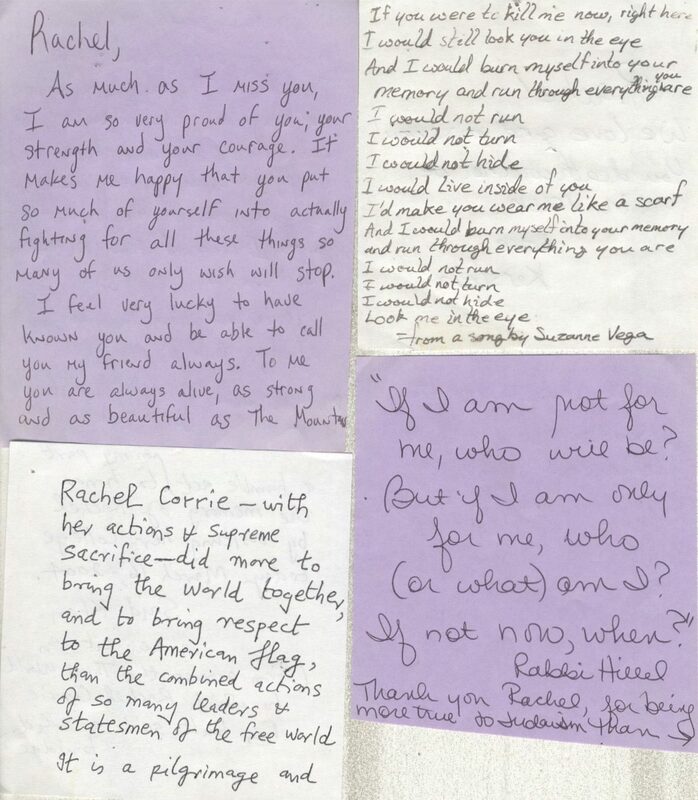 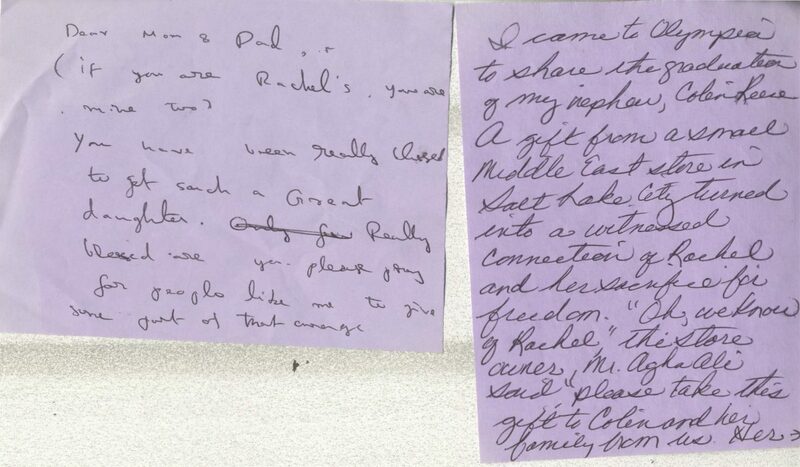 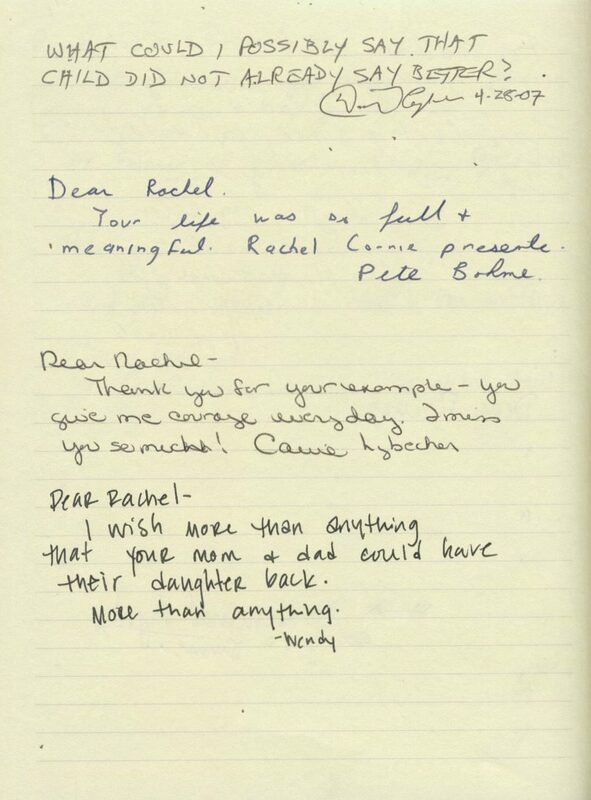 “Rachel Corrie Deserves Justice,” anonymous letter, sent to the “Rapprochement” email list from ISM. 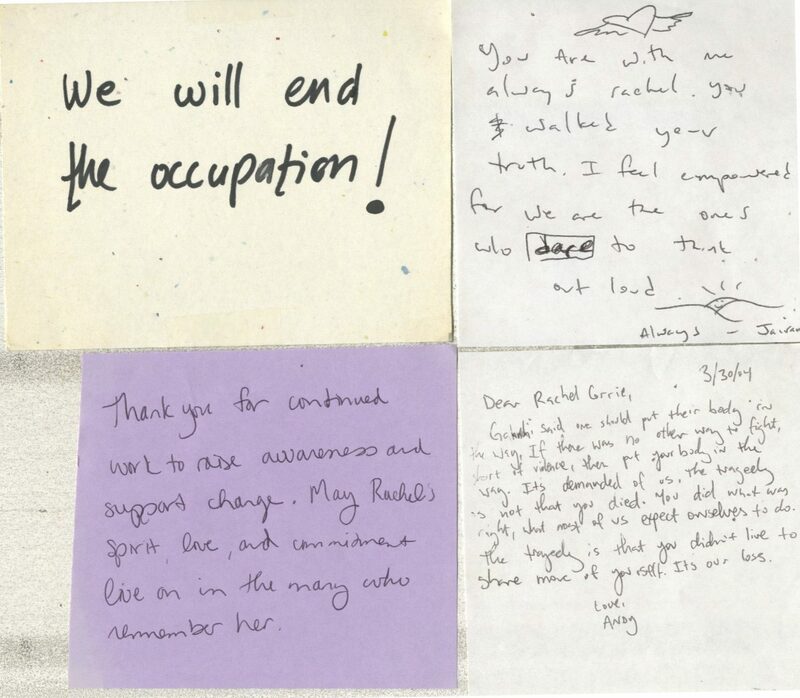 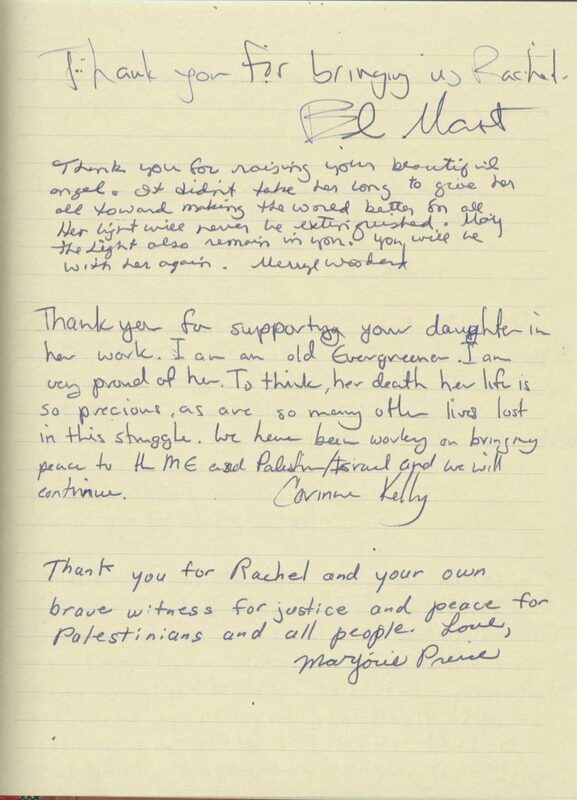 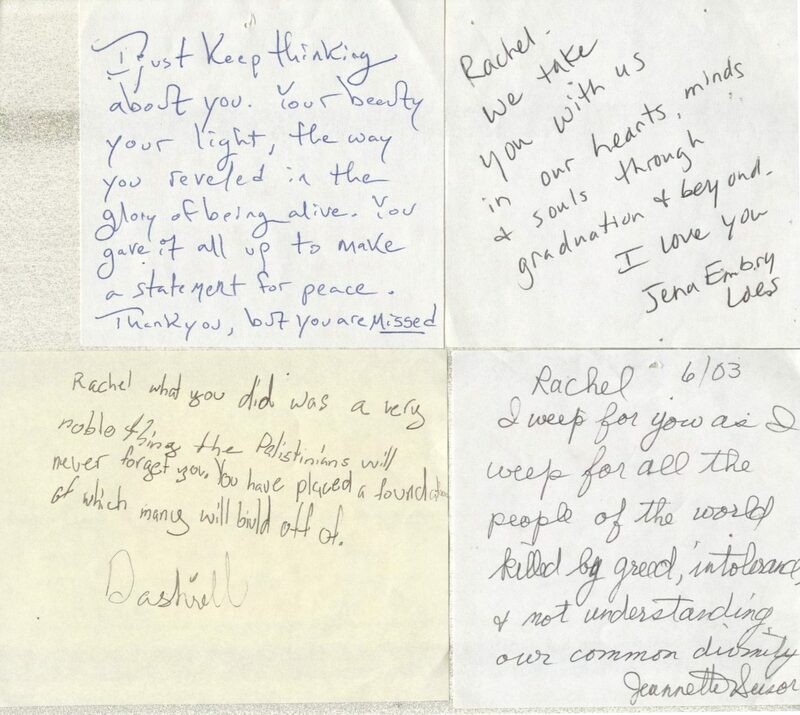 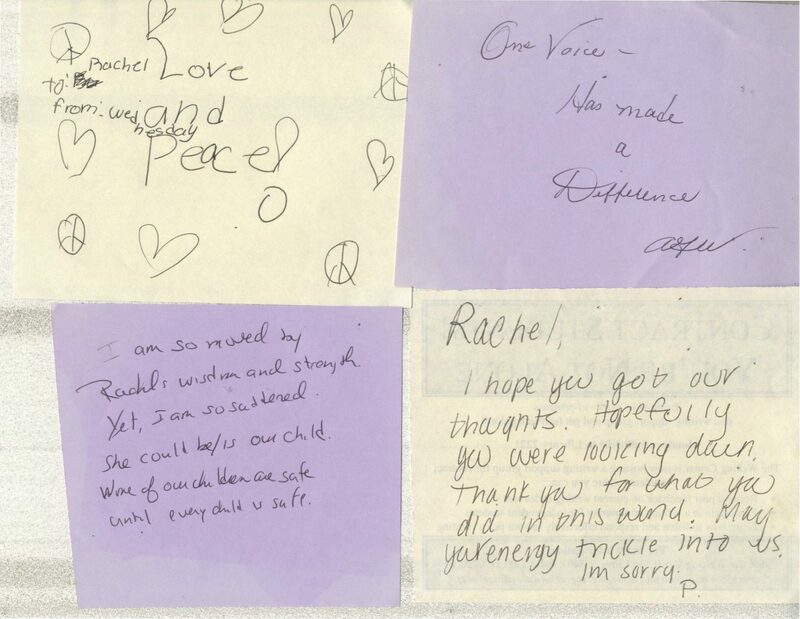 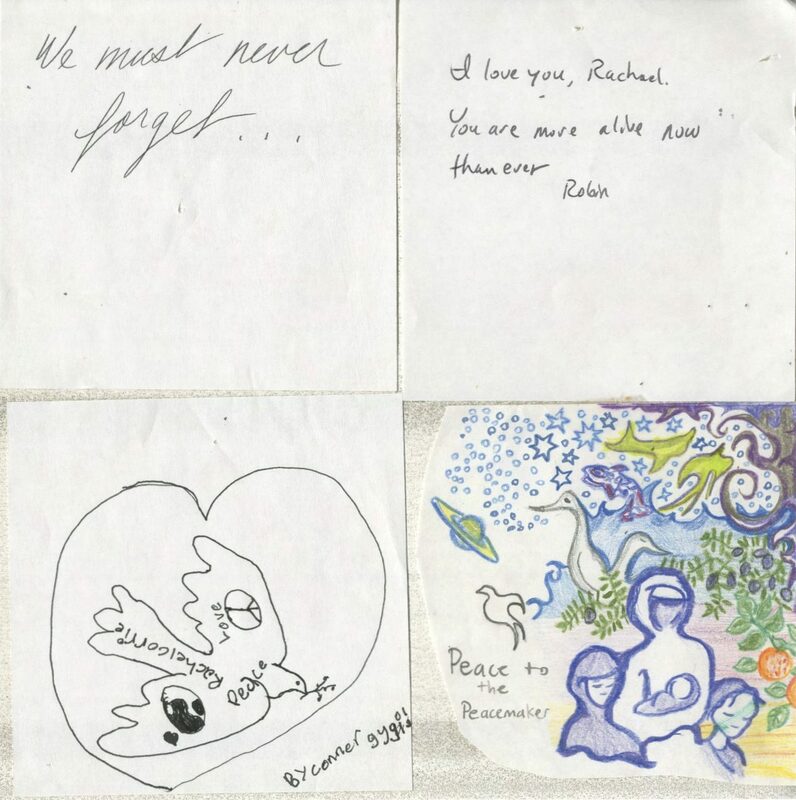 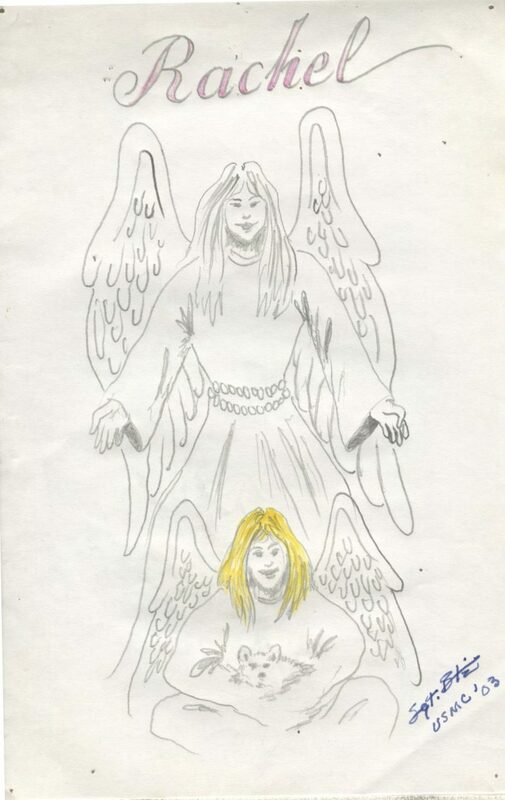 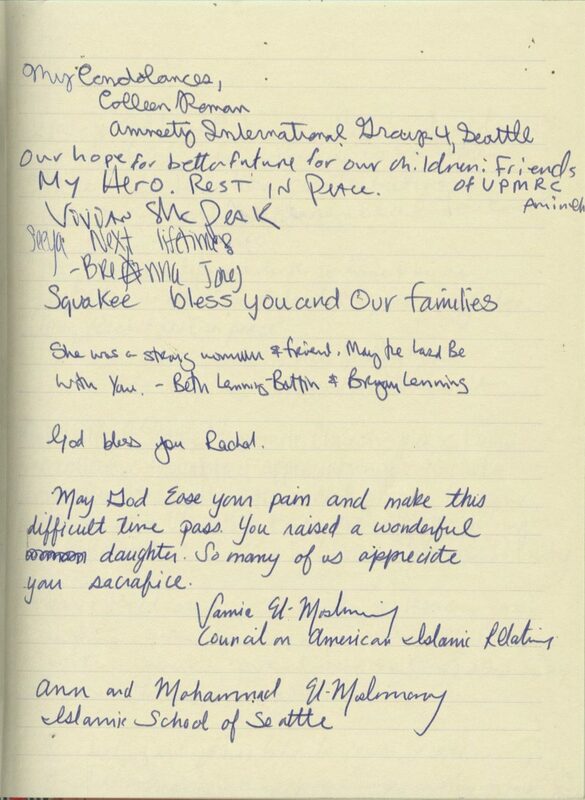 Letter from Rachel’s Parents to the Coalition of Women for Peace and the Israel Committee Against House Demolitions May 28, 2003, sent to the “Rapprochement” email list from the International Solidarity Movement (ISM). 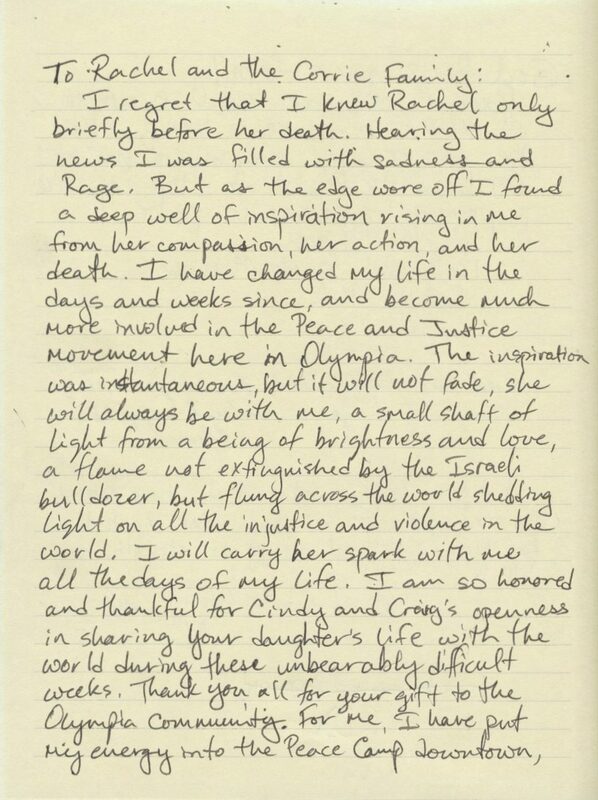 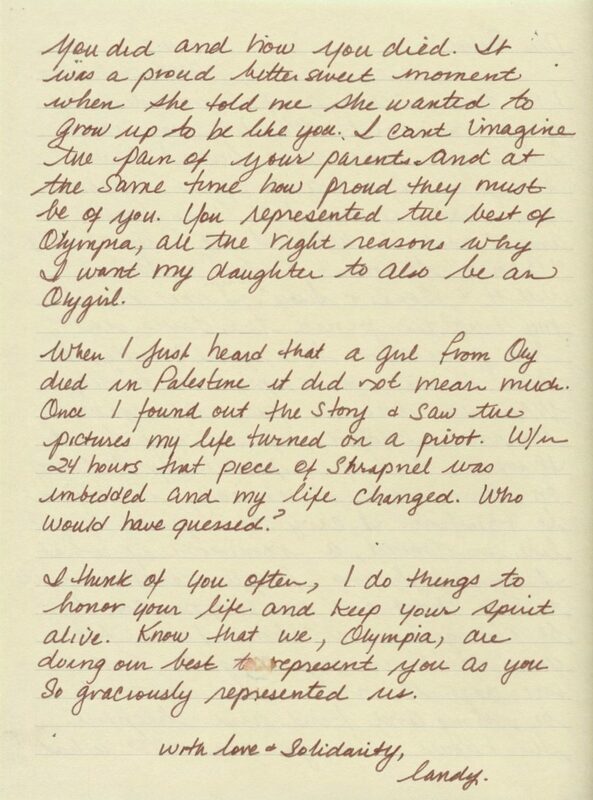 “Some Lives are Cheaper than Others” letter from Gila Svirsky, June 4, 2003, sent to the “Rapprochement” email list from ISM. 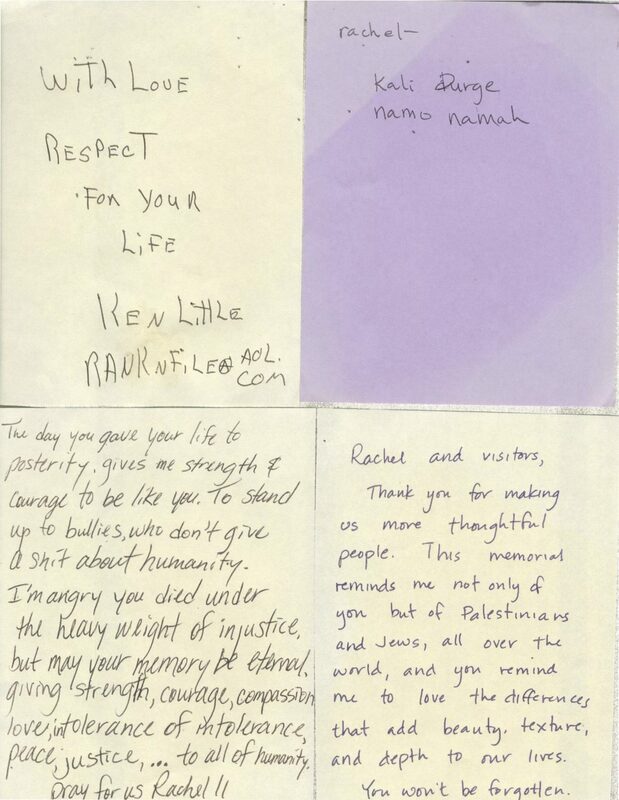 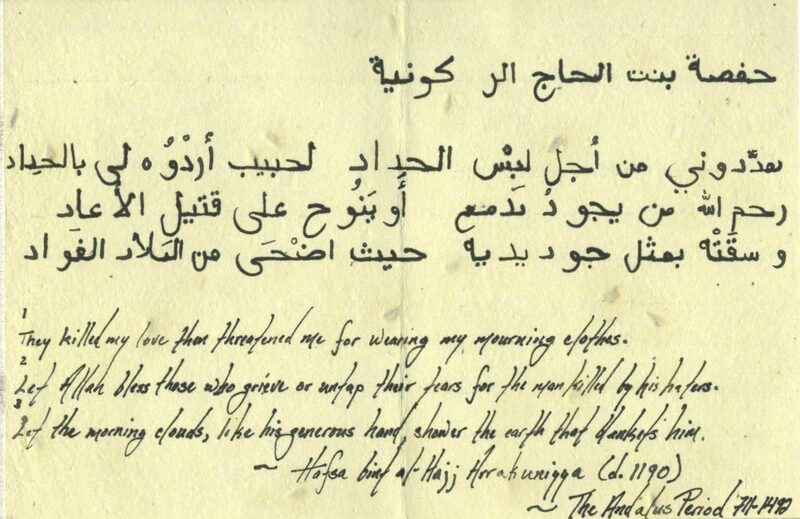 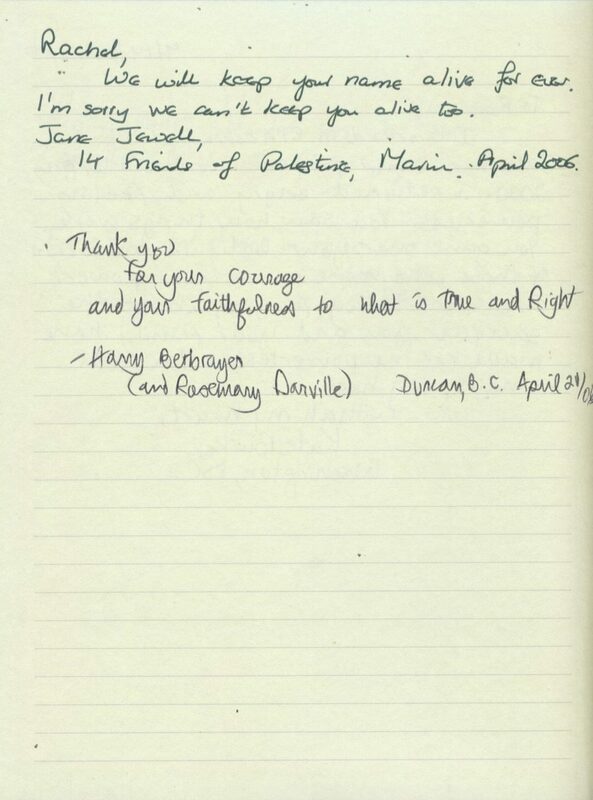 Letter from Mustafa Barghouthi, President of the Palestinian Medical Relief Society, March 18, 2003. 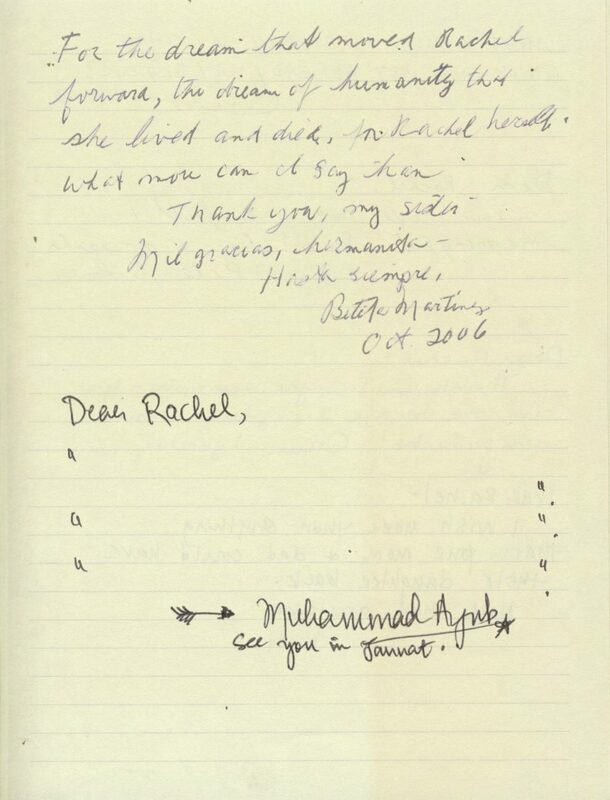 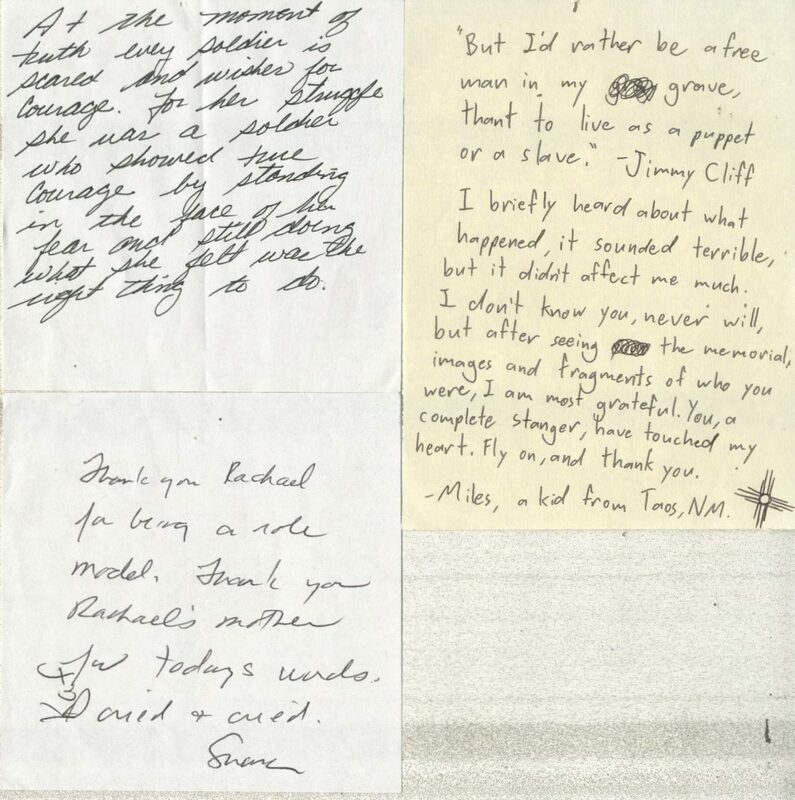 Letter from Phan Nguyen, March 19, 2003, sent to the “Rapprochement” email list from ISM. 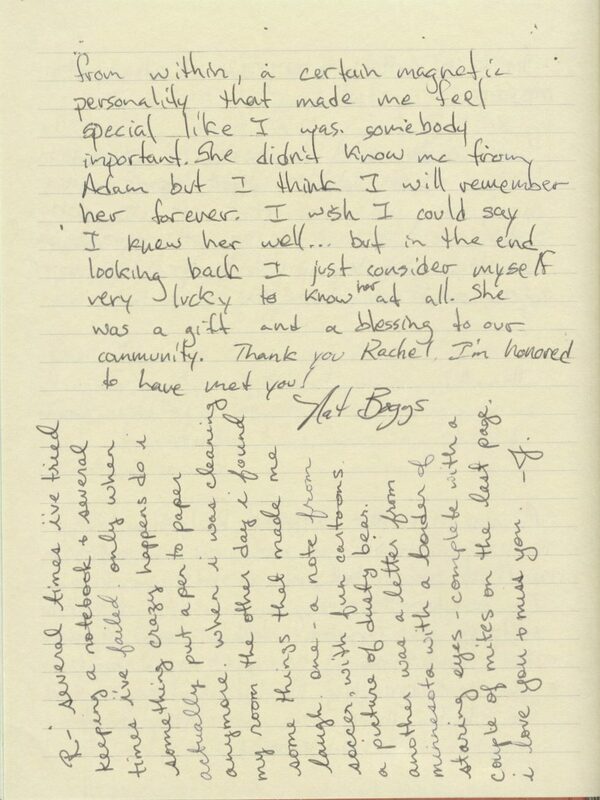 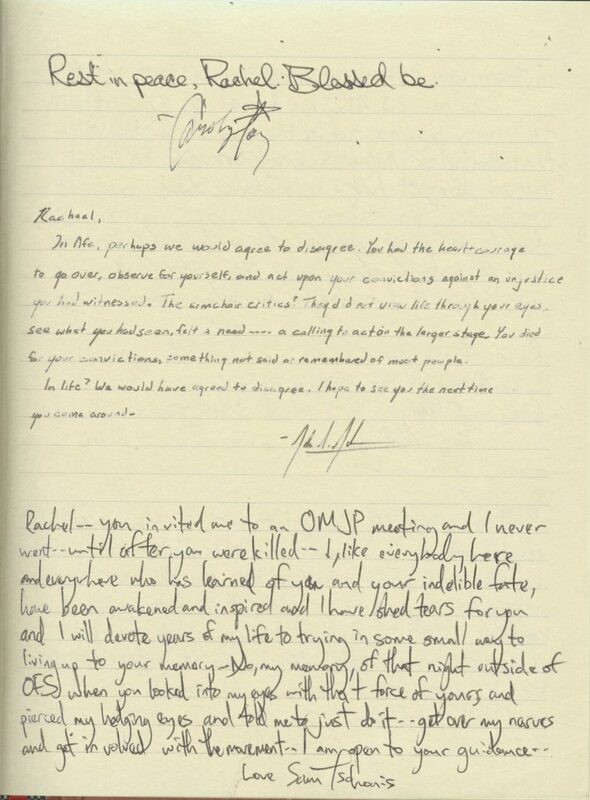 Letter from Tobias Karlsson, March 19, 2003, sent to the “Rapprochement” email list from ISM. 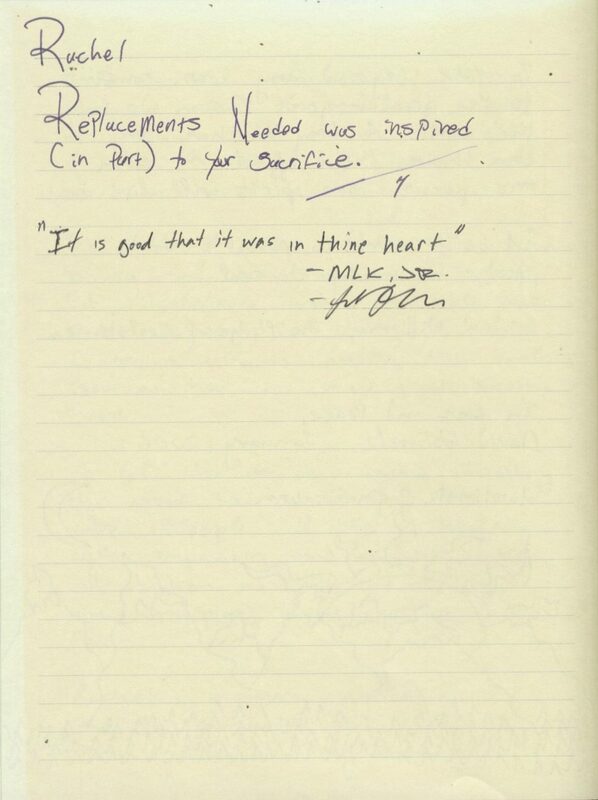 Statement by the AFL-CIO President John Sweeney, March 21, 2003. 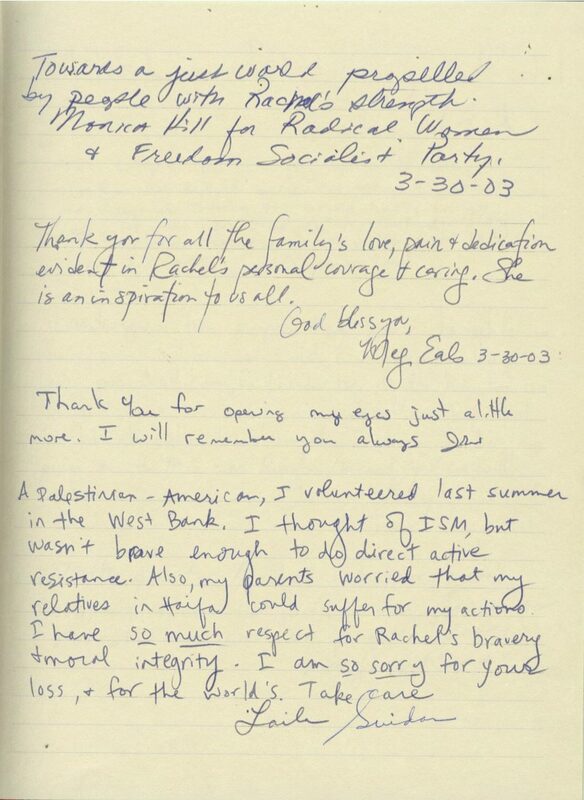 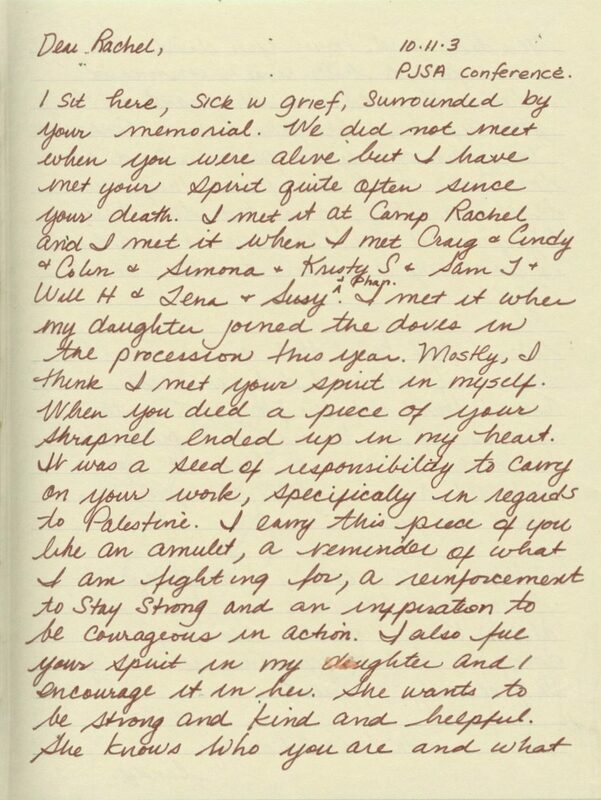 Letter from Yael and Isaac Naaman to Prime Minister Sharon and Defense Minister Mofaz, March 22, 2003, sent to the “Rapprochement” email list from ISM. 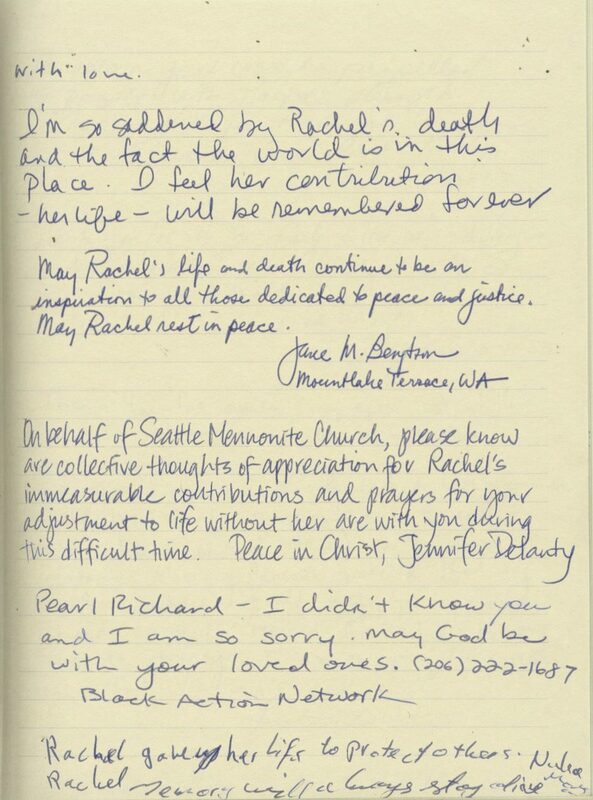 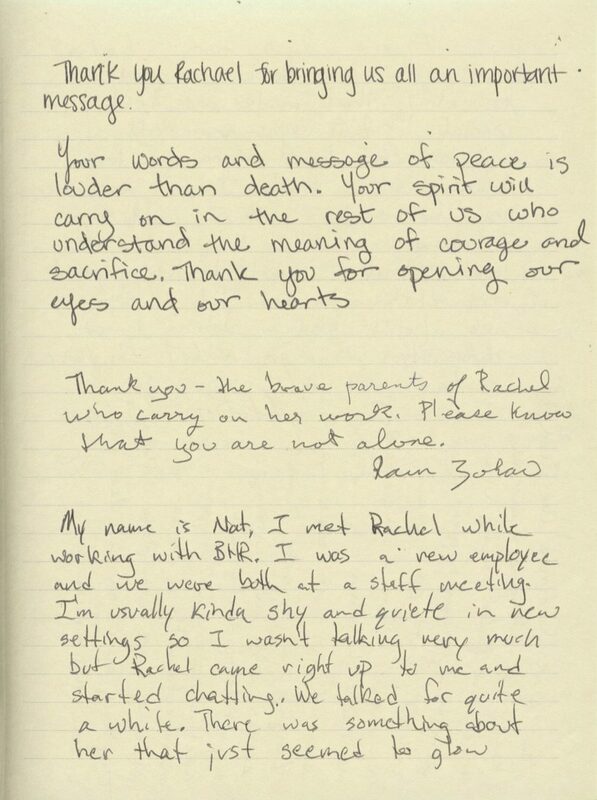 “Concluding Statement” from an anonymous letter titled “The Murder of Rachel and ISM,” sent to the “Rapprochement” email list from ISM.